Does Your Insulation Need Removing? Insulation in your attic that has been degraded from various issues, including aging, is likely to not be as effective as it once was. The most telltale sign of this is your energy bill sharply rising over time. It’s harder for your home to keep a stable temperature without needing to run the heat or air conditioning regularly, which is costing you more and more. 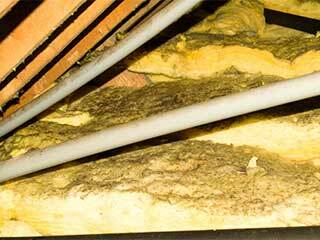 Insulation breaking down can also lead to it entering the air of your house. This can cause all sorts of health troubles for children, the elderly, and those with asthma or other breathing conditions. If you’re aware of water that’s leaked into your attic, it’s extremely important to get the insulation removed. Not only will the water have lessened the reliability, but also mold can begin to grow. This poses another health hazard, and should be taken care of quickly. Fire or smoke damage can also inhibit its effectiveness. Did your attic have some unwanted guests? Even if the rodents are long gone, they probably left behind tampered with insulation from digging and chewing. Their waste may have also infected it, which carries diseases that are able to enter your home. Whatever the issue, our professional team can help! Using the best tools available, we’ll carefully suction up all the insulation from every corner of your attic, and get it safely out of your home and disposed of. You won’t have to worry about any pieces escaping into your house in the process, we’ll make sure it’s all removed securely. With years of experience working on homes just like yours in the area, you can be sure to trust that we’ll take care of it without a problem. Our experts can also easily install new insulation if you’d like, so you don’t have to concern yourself with finding another company to tend to it! Contact Attic Cleaning San Jose today for any attic-related question or problem!